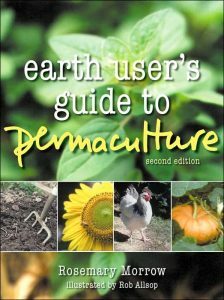 This Top 10 of Permaculture Books is obviously totally subjective, not complete, and awesome! It’s a work in progress, cause I’m re-reading each book in detail to write you this review. However, as I’ll first be reading a book on speed reading, you can expect quick results! Soon! If you have any comments, jokers, or suggestions about for our Top 10 Essential Permaculture Books, then please let us know! Also known as the ‘bible’ of Permaculture books, this book is so big and thick that even if you don’t end up reading it (because it’s almost unreadable) you can still use it as a weapon to knock down an opponent to Permaculture that you don’t manage to persuade with reason. PRO’s: This book has such a wide range of incredibly interesting information. 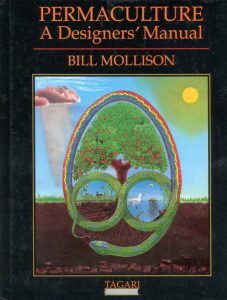 Mollison established Permaculture Design as a force to reckon with by writing this epic mind twisting tome. Tip: Study chapters that really excite you, skim through the rest, just looking at all the amazing illustrations by Andrew Jeeves is a delight. CON’s: Mollison admitted that the book was an unedited bunch of insights, notes, ideas, and rants, jotted down on pieces of paper and then sorted and arranged by friends. It seriously lacks editing, at times coherence, and is very very information dense (which to some isn’t a bad thing). An absolute heroine in the field of education, ecology, and social activism, Rosemary Morrow wrote a great book that covers all the basics. Her splendid follow up books help you to teach the contents of this book. So for people that are into action learning and facilitation Rosemary’s books are highly recommended! PRO’s: Covers almost as much as the big book above (almost), but uses one tenth of the amount of words to say it, and is very accessible and comprehensible to almost everyone. The contents is of practical use, and Rosemary’s lifetime of knowledge is condensed into a fun book with nice illustrations. CON’s: Not many worth mentioning, some last chapters seem a bit random, like Permaculture in the workspace and the dangers of Biotechnology. Totally relevant issues, just felt a bit out of beat. Number three and the rest coming soon! We would be happy to keep you up to date about similar content. After you sign up you can specify what else you’re interested in. We respect your privacy, we will never send you Spam, and you can always opt-out. Enjoy our free content, and may it inspire you to take action! Mediterranean Permaculture Presents: Top 10 Mediterranean Climate Low Maintenance, High Yield TreesClick below to see this cool post, and let us know what your experiences are with these trees. Let us know which books should be in this list according to you!